Belle de Louvain plums are very large, oval-shaped, and dark red, becoming purple when fully ripe. Belle de Louvain is primarily a culinary plum, with a sweet-sharp plum flavour when cooked. The flesh is also fairly dry, which is useful in recipes where the surrounding pastry or cake mix must not be diluted with excess liquid. The tree is strong and healthy, crops heavily, and is suitable for a wide range of situations. 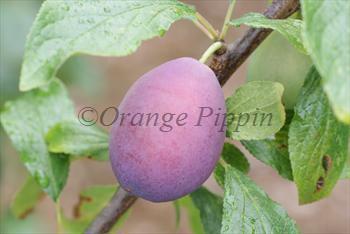 Another good culinary plum which can be grown in difficult conditions. Belle de Louvain is in flowering group 3. Belle de Louvain is self-fertile and does not need a pollination partner, although fruiting may be improved if there is a compatible tree of a different variety nearby. Since it flowers in the middle of the blossom season it can be pollinated by most other plum trees. Belle de Louvain is a useful plum tree for difficult situations. Its flowers are frost-resistant, and it can tolerate shade and cool summer conditions (including north-facing walls) whilst still producing a good crop.